May 1, 2013, 2:06 p.m. Article pages now have added depth and context, providing more opportunities for readers coming from social media to discover more content. By Justin Ellis @JustinNXT May 1, 2013, 2:06 p.m.
Reuters, as a wire service, has the concept of a minute-by-minute stream of news deep in its DNA. So it’s natural that its digital presence would echo that — a flowing river of information, where moving from story to story feels unencumbered. Yesterday Reuters unveiled a preview site for the future look and design of Reuters.com; it had given a sneak peek earlier. It’s a river-of-news type of approach that mirrors the flow of data on one of Reuters terminals, but has also become increasingly popular in the era of social media. 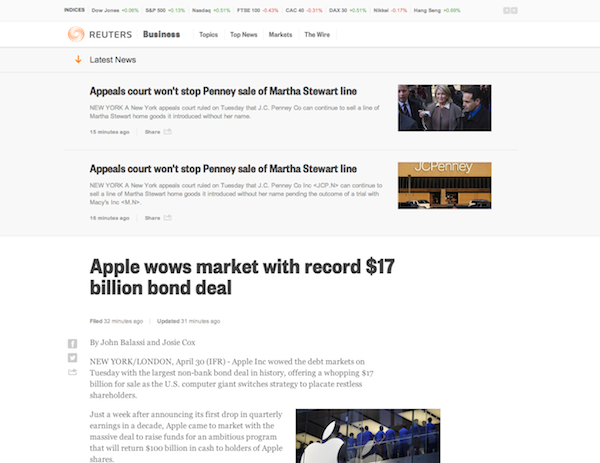 Go to an article page and you find that you’re actually placed in the middle of a larger stream of content — scroll up or down and you’ll find your story’s text actually lives in a bifurcated version of the Reuters front page. If every page is your homepage, why not treat them all like one? The preview version of Reuters.com retains many of the expected features of any news site, including a front page that gives prominent placement to timely stories, photos, and videos. While the navigation bar offers basic directions to topics, top news, markets, and the wire, the bulk of the homepage eschews modular front page design — headings for “U.S. News,” “Sports,” “Multimedia,” and the like — in favor of a feed of news and tweets that are happening right now. Articles opening within the stream keeps readers surrounded on all sides by news. In other words, Reuters has been Twitter-ized. Alex Leo, head of product for Reuters.com, said the larger theme of the new digital offerings is to create interconnected, contextual streams of information. “We wanted to create an experience for users that would give them the right amount of breadth and knowledge that they need from Reuters,” Leo said. In the new river of news, stories are surrounded by similarly related content. If you’re reading a story about Jason Collins becoming the first openly gay NBA player, you might see articles about basketball, gay rights, or sports. It’s similar for other stories, so with Pfizer, you’ll get drug manufacturers, and the pharmaceuticals industry. Context, in this case, cuts across different dimensions, Leo said, not just background on a story but also information on a particular industry, a region of the world, or people and places associated with a topic. Reuters is able to manage this through a deep tagging system, which means stories can pop up in different areas. Redesigning a news websites is an exercise in sacrifice and testing assumptions, because no matter how well you optimize a page it’s likely readers won’t get exposed to all of your work. Designers and editors have to deal in tradeoffs: How much room should you dedicate to headlines vs. story excerpts? How big can you make photos at the expense of text? What tools are readers really looking for on the page, and what are we keeping for our own vanity? It’s a move that recognizes the ascendance of individual articles over homepages, largely powered by social media. Leo said Reuters is taking some cues from services like Twitter and Tumblr that “display news and create engagement around the news.” But the emphasis on article pages also makes sense for a news company that, while having a long history and significant news-gathering resources, may lack the name recognition with consumers that other news sites do. If you’re someone familiar with a Thomson Reuters finance or legal products, you probably associate the name with news. By making a social-friendly site, Reuters wants to broaden that association to a larger audience. Roberts said news sites homepages are still a powerful driver of traffic, but the tide is shifting in another direction. “The days where you could drive big portion of audience to any single page? That’s pretty much done,” he said. The media have to be willing to adapt to changing times, Roberts said, and that means having a highly adaptable website and apps. “This is just the beginning,” Roberts said. Expect the new Reuters site to regularly tweak features and roll out new tools, he said. 3. Hosted on Amazon cloud, no more big iron datacenter for Reuters News. 4. Much of back-end built in Python and associated technologies. Again, modern! Webby! 5. Best tech of all: Amazingly dedicated team of people behind it, trying our best to get it right. Onwards to features, iterations & more! Oh yeah, we used MongoDB too. POSTED May 1, 2013, 2:06 p.m.
Ellis, Justin. "Every page is your homepage: Reuters, untied to print metaphor, builds a modern river of news." Nieman Journalism Lab. Nieman Foundation for Journalism at Harvard, 1 May. 2013. Web. 20 Apr. 2019. Ellis, Justin. "Every page is your homepage: Reuters, untied to print metaphor, builds a modern river of news." Nieman Journalism Lab. Last modified May 1, 2013. Accessed April 20, 2019. https://www.niemanlab.org/2013/05/every-page-is-your-homepage-reuters-untied-to-print-metaphor-builds-a-modern-river-of-news/.